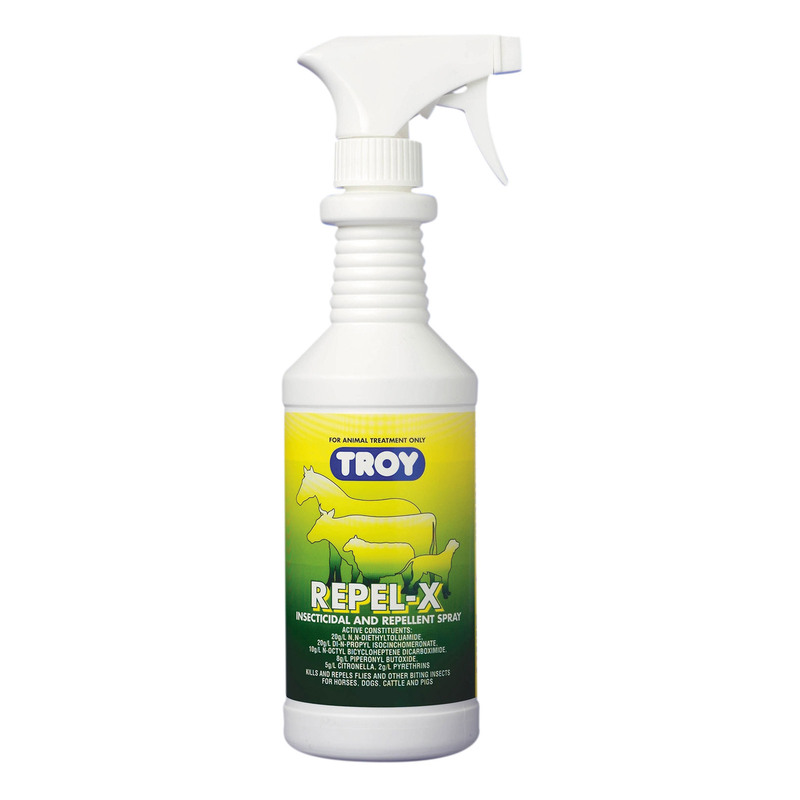 Troy Repel-X is a powerful repellant for keeping away fleas, flies, mosquitoes and other insects from biting animals. The fast killing action eliminates fleas and flies. The insecticidal spray destroys fleas and repels mosquitoes and other biting insects. The non-toxic repellant is safe to use on dogs and horses. The ingredients have insecticidal effect on fleas and flies. The fast-acting formula kills fleas and flies on dogs and other animals. With the repellant effect, it repels mosquitoes, flies and other biting insects to protect dogs from getting fly bitten on their ears and body. Open the cap and spray Repel-X lightly over the coat of a pet for a few seconds. Spray with a sweeping motion from head to rear. Apply twice daily when infestations are severe. Take care not to spray near animal’s eyes. For animal sheds, spray in the inner walls thoroughly and any other place where the flies and insects settle. Keep away from direct heat and open flame. Do not use near plastic material or fabrics like rayon acetate. If irritation occurs, discontinue use – consult a veterinarian. N-Diethyltoluamide, Di-N-propyl isocinchomeronate, N-Octyl Biccloheptene dicaroboximide, Piperonyl Butoxide, Citronella, Pyrethrins. It's a good spray ,with non toxic properties and easy to use. So far so good, and my puppy dosn't mind the smell! She rolls over grass and on the carpet, yet no mosquitoes around her when she's out. I even sprayed this on my door frame after some ants were coming in and they are gone! In our area there are lots of flies and mosquitoes, and it is really tough to keep them all away from irritating my two bulldogs. But using troy repel-x, it is quite easy to repel them all and no scratching for both these pals. Used once but has proved to be best and working effectviely. Darso was suffering from insect bite and couldn't understand what to do. So, I read about this product on vetsupply and happy to use it.